Vakıfbank’s women’s volleyball team defeated Rexona-Sesc in the final game to obtain the crown. 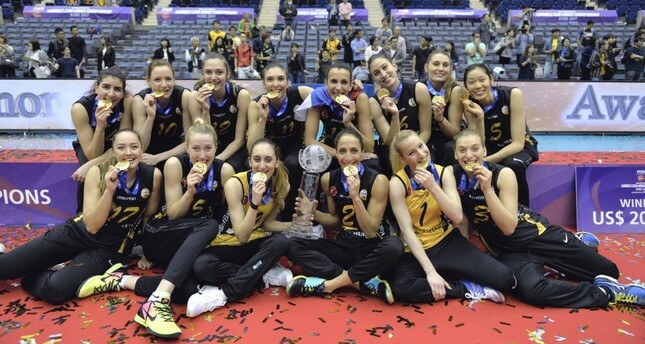 Vakıfbank's women's volleyball team defeated Brazilian Rexona-Sesc in the final game of the Federation Internationale de Volleyball (FIVB) Women's Club World Championship in the Japanese city of Kobe on Sunday to secure the world championship for the second time in its history. Vakıfbank won on straight sets with scores of 25-19, 25-21 and 25-21. Vakıfbank's Chinese player, Ting Zhu, played a crucial role in the victory by scoring 19 points and was selected as the most valuable player (MVP) of the finals. With a previous win in 2013, Vakıfbank also won this year's Confederation Europeenne de Volleyball (CEV) Women's Champions League, securing a place in the finals in Japan. So far, it has won the CEV Champions League three times, the Club World Championship two times, the European Challenge Cup and the Europe Top Teams Cup one time each. Ting was selected as the CEV Champions League's MVP this year, as well. Vakıfbank's Kübra Çalışkan was selected as the best Middle Blocker of the finals. Speaking after the victory, Vakıfbank Club Chairman Osman Demren said the team's success was a source of pride for him, the club and for Turkey. "We won the CEV Champions League on April 23, National Children's Day, and gifted it to children around the world. Our world championship came on Mother's Day. This is a present for all mothers. We are very happy. I am truly proud of every player. We are honored to be the most successful and medal-winning Turkish team in the international arena," he said. The team's coach Giovanni Guidetti said he stopped counting the number of cups the team had won a long time ago but noted that it had won two championships in a month. "We had a great CEV Championship League in Italy. Our success continued in Japan. I'm truly proud of my coaching staff and the players. They never give up," he said. The team's captain, Gözde Kırdar, said all of the team members had a share in their success. "Especially after our elimination by Galatasaray in the domestic league, the team stuck together and turned our fate around. This shows our quality as a team. We dominated this tournament, losing only two sets throughout. I am very happy and proud. This cup is my gift to my mother," she explained.MVP Ting also said she was very happy, expressing her delight in being part of the Vakıfbank family. Çalışkan said becoming the world champions left every other medal or cup they had won in the dust. "We are happy to have concluded our season with two important cups. This team got what it deserved. We want to continue next season from where we left off," she said.